About eight or ten years ago the DNR re-introduced lake sturgeon back into the Ottertail Lake and river system. Since then, my groups have encountered large fighting fish that seem to get more numerous and heftier every season. Here’s a sturgeon that a guest of mine caught on Tuesday this week. Man, what a crappy weather day it was, but the group, a fine bunch of folks from Missouri, sure were troopers. 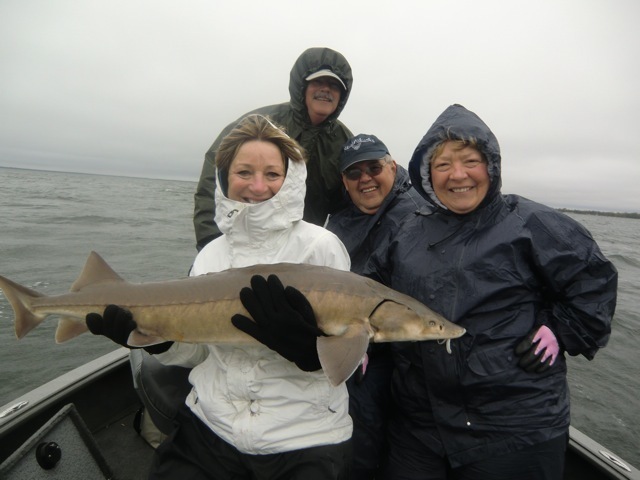 All of the sturgeon we’ve boated on Ottertail Lake have been accidents–fish that we hook while walleye fishing. But that doesn’t change how hard they fight and how cool a fish they are. The only problem I’ve had with these large ancient fish is they have, on occasion, run all the line off my spools–all of it–against some pretty aggressive drag settings. And they will also consume a good 15 minutes of a guide trip if you choose to fight one all the way to the boat. The lady in the photo–Marilyn–did a great job of fighting this fish. It was 41 inches long, fought like an angry log with a tail, and took about 15 minutes to pull aboard. It was the largest fish she’d ever caught–that’s cool! Good luck fishing, and enjoy what ever should come out of what ever lake you should fish on. It’s all good. Fish Good. Not all fish look like walleye. Marilyn, Dave, Sam, and Kathy, meet sturgeon, and they liked it. Things are happening again at Meister Guide Service. I quickly became exhausted trying to keep up with ice on Opening Weekend, a lack of shiner minnows, cold windy wet weather, and difficult fishing. The ice was finally gone a week ago. Today, Ottertail Lake is ice free for one week. The shiners began their annual spawn a few days ago–in which they enter warming current areas first, and then begin their shoreline spawn as soon as the lake temps get to about 55 degrees. Considering the fact that the ice has been off the big lake for only a week, it’s surprising the water temps are as warm as they are already–46-52 degrees–depending where you’re at on the lake. As for the fishing, it’s getting better. The walleye are finally getting away from spawn and are begin to show signs of grouping and feeding, but the number of strong fishing areas are still quite limited. Sorry I’ve been away. I want to keep up with my blogging, but the early part of the fishing season demands a lot of time as I spend most of my very little free time trying to catch shiners for bait. So far, shiners are still hard to come by at local bait stores. Hopefully, this week there is an abundance of shiners and the anxiety of running out of bait will start to wane. I’ve been getting some good shots of my Humminbirds, and some nice fish photos which I’ll share in the next posting. As for now, get a walleye on your hook–it sure is fun. Fish Good. Check out this image. Nice hill right? Nearly every single person that watches my graph on board my boat while I’m working comment about this particular image. Wether they are experienced or not, the are quick to point out that there is an island under the boat–and what a great place to stop and fish. Walleye, after all, live on islands right? Sure, sometimes–depends on the lake, depends on the time of the season, depends on food preferences and location, it just depends. But if there’s one way most anglers get fooled watching graphs, this is it. This image is the big fake out. I actually created this hill myself, for the purpose of demonstration. All I did was drive into an incline or up-slope, and when I got to about 15 feet of water I turned the boat around and drove back to deeper water. The graph in the meanwhile, has no idea what I’m up to–it just keeps drawing out the information the down imaging signal is picking up. That’s all the machine knows to do. All graphs work this way. You can’t buy your way out of it. It’s easy to be fooled by this signal. The one dimensional drawing can be very misleading. The graph simply draws a continual line at the place of depth. What you need to do is always keep track of your direction and try to imagine the bottom of the lake as you drive over it rather then depending on your units to describe the bottom for you. You need to be able to filter the information. This is where you can over-tech your way out of understanding exactly what’s under the boat. If you only believe what your graph says then you’ll probably be chasing false signals quite often. This is not a hit on graphs at all. This is a hit on the user. The machines are actually doing exactly what they promise to do, it’s up to us, the user, to consider the information relevant but understand that there’s a limit. Try to strike a balance–half machine half you–and then watch your fishing climb to the next level. Fish Good. I’m going to break from my Humminbird stuff for a post and complain a little. In the winter, I love ice. In the spring, I love to stand on ice and catch panfish with my kids or an uncle or friend–no business concerns. And then by about the 1st of April, I try and wish the ice away. By May 1st–I hate ice. There’s no reason for it, there’s no good in it. It’s just in the damn way. I’d like to break my new engine in. I can’t, the damn ice is in the way. Our walleye opener’s on Saturday (4 days from now), and the walleyes are just now beginning their spawn–and these aren’t Canadian walleye. So here’s what I think the ice is going to do and when. A few of our lakes are beginning to see ice–off. I won’t mention the names because I don’t want to be liable for sending a million anglers to the same poor lake who, otherwise, have no where else to fish on the opener. If the lake you want to fish on has a river or rivers going through it, then your lake might be open some time this weekend. It’ll be an real opening weekend–the lakes will open. If your lake of choice, is 3,000 acres or larger, and does not have current running through it, I don’t think the ice will be off on the weekend–maybe early next week. If your lake is 1,000 acres or less, there’s a good chance the ice will be off in 3 days–especially if we get some good wind. Once the ice is off the lakes the walleye will go into full-spawn mode, in which case the the fishing will be very difficult for a few days. If you can round up a handful of male walleye for dinner over the course of the next week–feel good about it and consider yourself a pretty good angler. The real trouble with getting a good chance at the walleye in the next week or ten days will be getting ahold of shiner minnows. If you can find a lake where the shiners are running, I’d fish it for walleye, because it’ll imply the walleye are done spawning and will be ready to do some feeding. Good luck this weekend, and remember, floating ice chunks are hard on boat hulls and lower units. Check this image out. 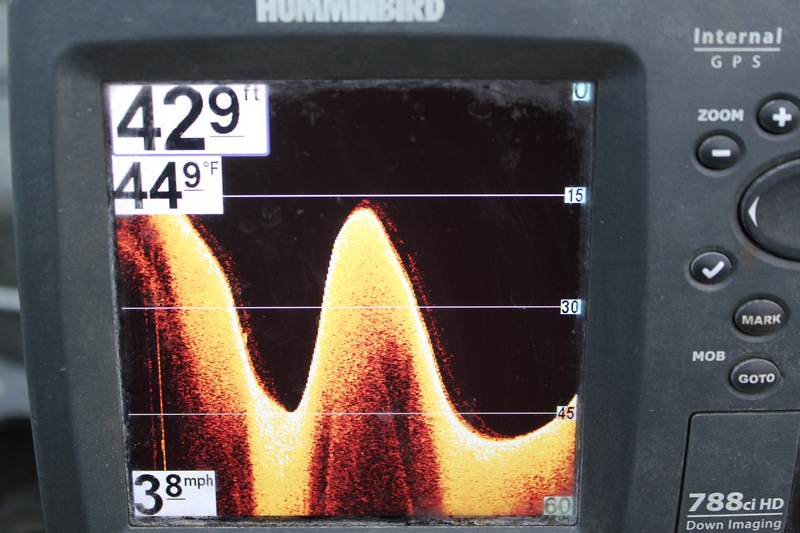 It’s a classically graphed school of walleye on my Humminbird. It’s “classic” in the sense that it’s kind of what you might see on simulator mode–meaning it’s very easy to know that there is a school of fish there. Again, I’d like to stress my adherence to the down imaging screen. It’s so clear. What about the arcs or lack of actual arcs as opposed to the jelly-bean images? I almost never get arcs–ever. I might see arcs on my graph five times an entire season. Don’t worry about the shapes. Just know there is something down there. The next step is to catch one so you can begin to build a working sense of what you’re seeing on your graph when something comes on the screen–like identifying birds in flight. Look closely at the picture. Notice how some of the walleye are smaller and faded while others are bright and heavy. 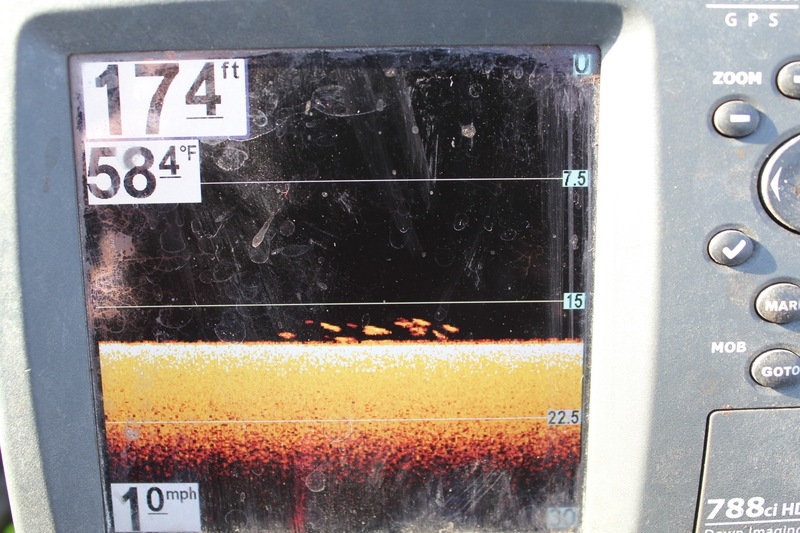 Those differences can pertain to size, however, most of the time we are viewing walleye directly under the sonar signal (bright yellow and heavy) while the others (weak faded red) are fish on the edge of the signal. It’s important to note the “faded” or weak signals. It suggests that the group of fish might be large as we are clipping fish on the edge of the signal–meaning the school extends beyond the signal’s coverage. That’s a good thing. I walked out onto Ottertail Lake yesterday and checked the ice. Yes, we still have ice. In fact, we still have 27 inches of it. That’s actually a positive depth. Last week it was 30 inches. I’ll being doing a close study the next few days to figure out how fast the ice will degrade in May–under intense over head sun. Yesterday the top 3 inches of ice was mush, the mid-ice was soft and there was a little hard ice towards the bottom in one hole. Otherwise, I was pleasantly surprised to find that the ice was rotten all they way through. This sounds like a dumb thing to bother my time with but I enjoy doing studies like this. As the ice comes on in the late fall, I do the same thing. I watch it and study it to see it’s progression. With the information I gain I can determine when the ice will be safe enough to get my first ice fishermen on the lake–safely. This spring has taken everybody by surprise. The walleye should be spawning across the region right now but they are inhibited by 2 feet of frozen water. Walleye need certain water temps to spawn (45-50 degrees) successfully. If they don’t have those temps, along with access to lake shorelines (where most of the walleye spawn around mid-Minnesota) then they just can’t. When it gets late like it is this spring, I get concerned that their biological urges my be passed by. Will they spawn at all–if it gets too late? I know crappies and bass will hold eggs or skip-spawn if the water doesn’t warm properly and at the right time, so my guess is that under the wrong conditions walleye may be inclined to not spawn too. Also, on a fishing guide service, fishing, and business perspective, I’d really like the ice to go the hell away. Most anglers and business owners in the tourism sector feel the same way. We need good openers to help get us rolling into the summer. I know this ice junk might interest me, but it’s probably boring for you, so I wanted to put up another Humminbird photo and caption. Check it out and enjoy.